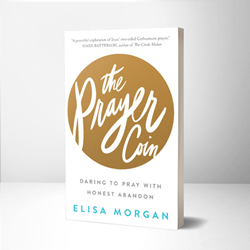 In the upcoming book, "The Prayer Coin: Daring to Pray with Honest Abandon" (Discovery House Publishers), author Elisa Morgan explores this two-sided masterpiece of prayer, inviting readers to the intimacy Jesus died to provide. When asked, “How does Jesus teach us to pray?” most Christians would probably answer, “through the Lord’s Prayer.” But there’s another powerful example from Jesus in the Garden of Gethsemane, where he modeled a prayer that can revitalize and transform any believer. In the same sentence Jesus both requested (“Take this cup”) and relinquished (“Not my will”). He prayed two sides of the “prayer coin”—honesty and abandon. In the upcoming book, "The Prayer Coin: Daring to Pray with Honest Abandon" (Discovery House Publishers, ISBN 978-1-62707-883-2, $16.99, Hardcover, July 17, 2018), author Elisa Morgan explores this two-sided masterpiece of prayer, inviting readers to the intimacy Jesus died to provide. Morgan, named one of Christianity Today’s top 50 female influencers of the church and culture, had her own epiphany while wrestling in prayer. Should she be more open and honest in a “pour your heart out” way, or should she simply submit to God’s will and wait? She discovered, through the example of Jesus, that she could do both. She terms this method the “prayer coin”—flipping from the brutal honesty of our own desires to a complete abandon in allowing God to lead. Moving from one side of the coin to the other and back again creates a new intimacy with the Creator. In "The Prayer Coin", Morgan shares her own journey as well as the examples of others as she leads us along a path of deeper fellowship with our Father—through his gift of prayer. "The Prayer Coin" is available in hardcover as well as audiobook and ebook formats. A companion journal and 6-lesson DVD are also available. ABOUT THE AUTHOR: Elisa Morgan is in demand as a speaker and author who communicates the truth of God’s Word in captivating ways. Morgan is President Emerita of MOPS International (http://www.mops.org) where for 20 years she served as CEO. Under her leadership MOPS grew from 350 to over 4,000 groups throughout the United States and in thirty other countries, influencing over 100,000 moms every year. She currently co-hosts the syndicated radio program Discover the Word (http://www.discovertheword.org) and writes regularly for the Our Daily Bread devotional (http://www.ourdailybread.org). She has written over 25 books, including The Beauty of Broken, Hello, Beauty Full, She Did What She Could and The NIV Mom’s Devotional Bible. Morgan received a BS from the University of Texas and an MDiv from Denver Seminary where she now serves on the board. She is married to Evan (founder and president of christianuniversity.org) and has two grown children and two grandchildren who live near her in Denver, Colorado.